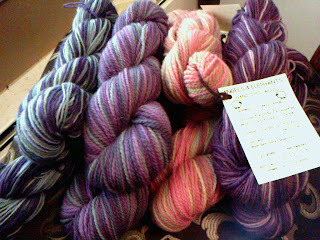 in deep purple to medium purple to pale violet (maybe this for the Bellatrix socks?). And here is a final shot of (and it's impossible to get the true color of the yarn which is a deep and bright garnet color) of my Baudelaire socks that I finished up. I can't get a good close-up of the lace pattern with my camera, but I got some fairly decent ones a few posts back. They are very comfy and snuggly! I love them! Jim had gone to Michaels and picked up a bunch of rolled casting to use for my belly mask. With how crampy and odd I've been feeling everyone is getting ready for this baby to come any day. I'm still at 36 weeks though and knowing that I've given birth with my other children anywhere from 39 to 42 weeks there's just no telling. But a nice glass of wine definitely calmed things down the other night. Sometimes I can't even figure out how to get into a comfortable position where it doesn't feel like the baby is trying to completely turn itself around or over, or where my stomach doesn't feel like it's pushing itself out into everything I get near. Other times it feels completely like it's a part of me that doesn't interfere with anything at all. This has been the most unique of my pregnancies, but Jim tells me that they all have had their own issues like this. I seem to be able to forget anything unpleasant then I guess. I would love for Winter Break to go on, and I'm a little sad for there to be only one more week. I'm enjoying this break from routine and obligations so much. I always do. Summertime is too long of a break, but these small breaks really make it nice. Especially now when I'm physically uncomfortable for one reason or another lately and love not having to get up early, or run to ballet, or drive kids back and forth to schools and all the other stuff we have to do. I love being able to do what I want to do when I want to do it. Again, what I miss the most from homeschooling. Well, time to wind the yarn and think about what I want to use to start those booties. Sometimes after it's wound into a ball it starts to look like something completely different than when you see it in a hank. It begins to take on a life of what it wants to be. When I have more time, I think I might even start dying my own yarns. I have so many ideas of what I want to do but I'm trying to just take things one day at a time, at least until after the baby comes and we are settled back into some sort of a routine. Jim's Yummy Yarny Xmas Present for me!